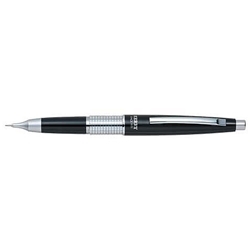 An elegant automatic pencil designed for professionals and enthusiasts. The dual-purpose cap provides proper balance while writing and protects writing point when pencil is not in use. Glossy metallic barrel with silver accents is hand-assembled with watchmakers tools for precision and accuracy. Available in .5mm and .7mm point sizes. Refillable with Pentel Super Hi-Polymer Lead and Z3-1 refill eraser.